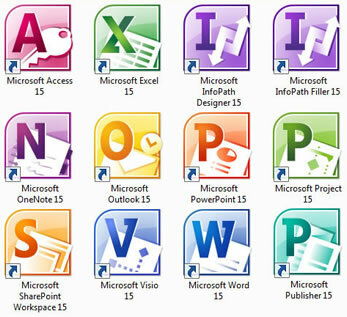 Paul Thurrott has managed to get his hands on a copy of the Microsoft Office 15 Technical Preview. He's posted a plethora of screenshots and more details about what we can expect on his website. He outlines his experiences from installation to usage but stops short of a full review since Office 15 isn't even in beta yet. Although only a handful of select partners have received the Office 15 TP -- and under a strict NDA, I might add -- information has inevitably begun leaking like broken faucet about the upcoming office suite. Here are some of the things we already found out last week. Thurrott installed the Office 15 TP onto a multi-touch tablet running Windows 8 to get the full experience. He had some installation issues while performing a clean install, but successfully upgraded from Office 2010 with no problems. The Office 15 TP install left a curiously large number of irrelevant live tiles on the Metro home screen, which is one of probably many quirks to be found in the TP. The Office 15 TP contains all the usual suspects you'd expect to find in a Professional or Enterprise edition of Microsoft Office, but it looks like the upcoming version will also include "Lync" and "My Site Documents". These two items are expected to usurp Sharepoint as the preferred method for inter-office communication and collaboration. There appears to also be integrated Skydrive support, which could prove to be useful for sharing documents amongst home users. Overall, the UI is clean and minimal. The infamous ribbon is minimized by default and the Metro interface is present, however some refinements are still left to be made. There appears to be a full screen mode, presumably useful for tablets. Also, there is now a "touch mode" toggle which further tailors the experience for tablet users -- a mode which Thurrott claims worked pretty well on his tablet.